Here at Lockaway Storage, we know our success is due to our wonderful team. The care they give our renters is unparalleled and we want to highlight their milestones along the way. 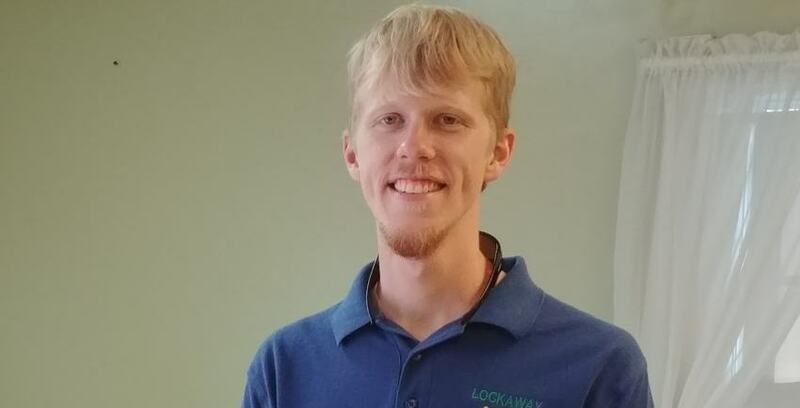 Below is an interview with Eric Clark, who is celebrating his 1-year anniversary with Lockaway Storage. You can meet Eric at Lockaway Storage on Crestway Drive in San Antonio, TX. Shannon: Hey, Eric. How many years are we celebrating? Eric: This will be my first. Shannon: Oh, fantastic! Congratulations! What kind of job did you have before getting into the self storage industry? Eric: I was mostly in the fast food industry. Shannon: Interesting. Were you working front or back of house? Eric: A little bit of both, but I eventually worked up to the management. I worked for McAlister's for four or five years. The actual reason we moved out to San Antonio in the first place was that I was managing for Raising Cane's and they offered to relocate me and my wife out here for opening the newer stores. Shannon: Where were you and your wife located originally? Eric: We were located in Mobile, Alabama. About 13 hours away. “Eric is a great worker. He is always on top of his job. Eric has proven to be a great asset to this team and has done a great job turning around the carwash and facility that he is running now. We are grateful to have someone like him on our team." Shannon: That’s a pretty long way. What made you decide to go from the fast food industry to self storage? Eric: Ending up in self storage was a surprise. I had always had a notion of getting out of the fast food industry, just to pursue really being my own boss and working at my own pace. I work better at my own pace. Then I wasn't really wanting to buy into some of the directions that our company was going. It wasn't the same place that I had started out four years prior. Their company was great for me, it just felt like the right time to go ahead and look for something else. So, yeah, self storage is a brand new thing for me. Shannon: I bet that was exciting! Was there anything that surprised you about the self storage industry once you started working at Lockaway Storage? Eric: Honestly it surprised me how in demand self storage is. I had seen various self storage places back home and coming here there are several locations here in San Antonio. It's really wild to me how big those facilities are and just how many people need storage in this area. Shannon: Did you find any similarities between your previous work and working with Lockaway Storage? Eric: There are definitely customer service similarities. It felt the same, but you get to be more at a slower pace. It’s not just saying, “Hi, bye.” and “Here is your food.” You can actually sit down and get to know that person, have more of a personal conversation. “Eric has reached out to me for assistance, as I am a Senior Team Member. He takes pride in his work and is willing to learn and overcome new challenges that arise with the position of manager. He is a great asset to SPMI." Shannon: That’s so true. With that, do you feel like you’ve made a connection with any of your customers over the past year? Eric: I would say so. Surprisingly, we ran into a lot of people who were from back home in Alabama and grew up in the same area. It's a small world and I actually have a lot of tenants hear that are from where we came from. It's great to see that there could be a million places in Texas to be and they're here. Shannon: That’s really amazing. Do you have any advice for someone who is interested in getting into self storage? Or maybe is already in it and wants to become a manager? Eric: Yeah, I would say just to have an open mind. It's really hard to train someone on a situation when virtually everything is a new situation. Every customer is a new experience, a new problem or you could have the perfect new tenant. You just never know. Since you never know what is going to happen, you have to have an open mindset. Shannon: Great advice! Is there anyone who you feel helped you through your first year that you would like to give a shout out to? Eric: This is a question that I knew I was going to have the most difficulty trying to answer! I have an answer for everything else, but this one is hard. It's really hard to narrow down who all have been there for me. I was always able to reach out to the manager of whatever location I was at. Now that I'm here permanently at Crestway, I could easily ask my wife, Tiara. She works for the company as well. I could ask her questions, but there are going to be some things that she doesn't know as well. Being here makes it easy to reach out to Henry or Corey or even Aurora, they honestly have all helped me out. “As long as I've known Eric, wherever he's worked he has always given his all. He's committed and passionate about whatever he does and that goes for this company as well. He truly amazes me with what he's doing with Lockaway Storage - Crestway. This was a whole new experience for him and I told him that when he first started it would be. It was nothing he couldn't handle or figure out though. He wasn't trained for the car wash, but he's figured out how to run it successfully. Hours of youtube videos, calling people, taking it upon himself to figure it out. I've stood out there and have seen him sweating in the heat trying to figure out why certain parts aren't working and 99% of the time he figures it out. He's out there making sure the property and car wash are well kept and are running properly. A lot goes into this facility, but he's managed to figure it out and continue to rise to the challenge. He's brought the numbers back up, customers that are still there from when I was an assistant absolutely love him, as do the new tenants who meet him. I just love seeing how much things have changed for the better at this location. It's where I first started with the company and it's really cool seeing a facility I personally care about being run by someone I know is going to give his all and do things the right way. He cares about the property and every single person who walks through the door. He truly inspires me, and always has, to have a heart as big as his. I really look forward to seeing how much he grows with this opportunity and to see where it takes him." Shannon: That’s great to hear. You mentioned that you worked at multiple locations. Which ones were they? Eric: I worked at the Highway 46 location, that was my home store. I also work at Boerne, Evans Rd, and the Garden Ridge location. Shannon: Was there much difference between working at those different locations? Eric: Just different changes of pace involved. Some days it is pretty slow here as far as people on the property, But we have a car wash that we manage next to us that keeps me busy as well. Shannon: Interesting! On the more personal side of things, what is your life like outside of self storage? Do you have any hobbies? Eric: Yeah, so we actually have a lot going on. We've done some traveling here and there. In the future, we hope to go back home to see our family. Our dogs are probably one of our biggest hobbies — we have four. We have two lab pitbulls. All of our dogs are rescued: a chihuahua-terrier, which is our oldest and is a little couch potato, and we have a lab-pug. It's a small miniature little lab with a curly tail and a spotted tongue. They are adorable. They aren’t allowed in the office, but they come around sometimes. Shannon: Having four dogs would be a hobby in itself! But they sound adorable. Is there anything else you would like to add about your experience with Lockaway Storage? Eric: It's been a blessing ever since we moved here two years ago, and the first place we went to was a storage facility that just happened to be Lockaway Storage. Two years ago my wife started and one year ago I started. We couldn’t be happier!